One of the most important news reporters in the world will deliver the 42nd Joe Creason Lecture in Journalism at the University of Kentucky on Tuesday, April 16. Peter Baker, chief White House correspondent for The New York Times, will make the address in the auditorium of the W.T. Young Library at 7:30 p.m. The lecture is free and open to the public. The lecture is named for UK journalism alumnus Joe Creason, who earned the high regard of Kentuckians as a feature writer and columnist for the Louisville Courier Journal. The newspaper, then owned by the Bingham family, endowed the lecture series after Creason’s sudden death in 1974. Baker, 51, is a leading chronicler of recent American politics and government. He has covered the last four presidents; has won all three major awards for White House reporting, two of them twice; and is the author or co-author of five books. He and his wife, Susan Glasser, who writes the “Trump’s Washington” column for The New Yorker magazine, are working on a biography of former Secretary of State James A. Baker III. They spent four years in Moscow as bureau chiefs for The Washington Post, where Baker worked for 20 years before joining the Times in 2008. At the Post, Baker co-authored the paper’s original story breaking the Monica Lewinsky scandal and was its lead writer on the impeachment and trial of President Bill Clinton. He was the first American newspaper journalist to report from rebel-held northern Afghanistan after Sept. 11, 2001, spent most of the next eight months in the country, then spent six months in the Middle East, reporting from inside Saddam Hussein’s Iraq and around the region before embedding with U.S. Marines as they drove toward Baghdad. 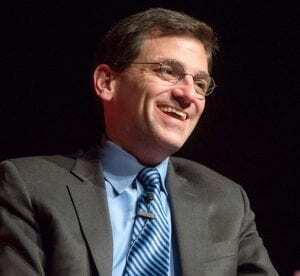 After covering President George W. Bush for the Post and President Barack Obama for the Times, he went to Jerusalem as Times bureau chief but was called home to head up the paper’s coverage of President Donald Trump. Baker is a native of Falls Church, Va., and attended Oberlin College. His book, Days of Fire: Bush and Cheney in the White House,” was named one of the five Best Non-Fiction Books of 2013 by The New York Times Book Review. His 2017 coffee-table book, Obama: The Call of History, is being released as an expanded and updated traditional book this spring.